The Kirk vs. Picard debate will wage on in internet forums for centuries to come, but you can settle it at home by gathering your friends around a table and going head-to-head with Star Trek Risk. It pits your favorite Starfleet captains against each other including Kirk, Picard, Sisko, and Janeway. Jonathan Archer is also in the game. 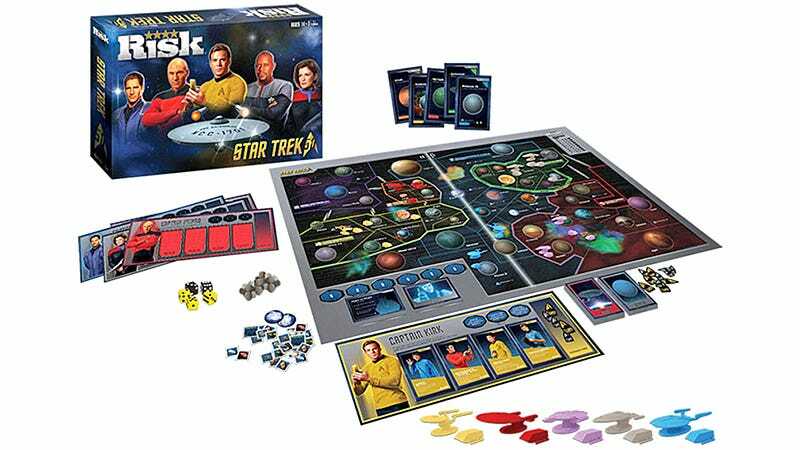 USAopoly helps celebrate the 50th anniversary of Star Trek this year with yet another facelifted version of the popular strategy game. Star Trek Risk even comes with its own backstory to help explain the game’s cast of characters, involving Q and a plot to gather Starfleet’s most TV-series-worthy captains in order to determine once and for all who’s the best commander. In addition to a planet-filled game board featuring the various political quadrants of our future galaxy, Star Trek Risk also comes with game starship and shuttlecraft game tokens. If you find Risk gets boring sometime after hour 10, you’ll at least have something else to play with.